It sat on a Javelin frame but this 2 seater could be equipped with a 390cube V8. This was AMC’s muscle car, with a 6 speed transmission and the big V8. Born from the Hornet (at least from the doors forward) it was designed to be economical. The SST moniker signified that it had a V8. This model hadn’t changed much at all since the 1967 model. 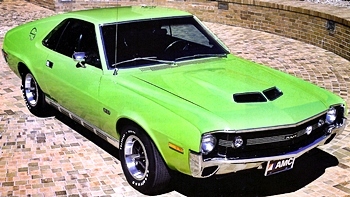 The AMX was no longer a separate 2 seater model, it was now the top of the line Javelin. The small size and cost made this a favorite among young buyers. A slight redesign gave it a smoother look with flares over the wheel wells. 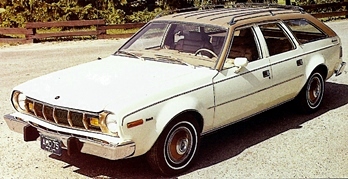 This 4 door was the least expensive full size AMC. This X package included wider tires, slotted wheels and the distinctive stripe. The wagon looking Sportabout was more popular than this 4 door sedan. 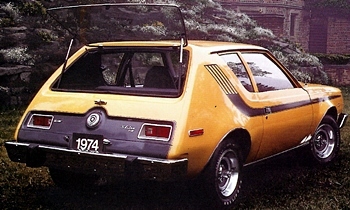 AMC debuted the “Levi” model Gremlin which had blue jean material upholstery. 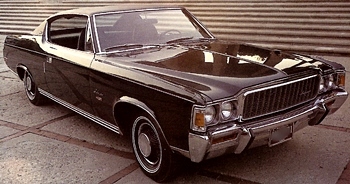 The Matador came in a 2 door coupe (shown), a 4 door, and a station wagon. This was the last year for the Matador due to sagging sales and a dated design. The oil embargo / fuel crises lingered on which increased small car sales exponentially. Considered a compact car Hornet sales also soared due to the gas shortage. The ever popular Javelin and AMX were victims of the gas shortage, this year would be the last. 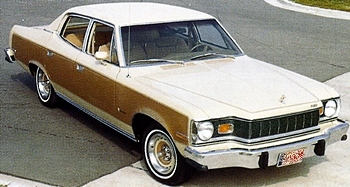 Matador came in a 4 door sedan (shown), a 2 door coupe and a station wagon. This model was actually AMC’s new NASCAR race car, so this “X” package coupe was developed. 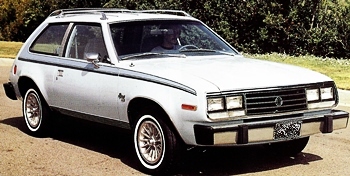 This was a good selling model for AMC as it was the only compact wagon available. 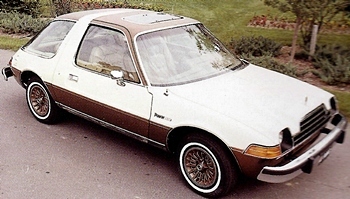 After the demise of the Ambassador, Matador became AMC’s “big car”. Cheered on by 3 big NASCAR wins the Matador “X” option was a brisk seller. People may have talked about it’s weird look but they made it AMC’s top seller. 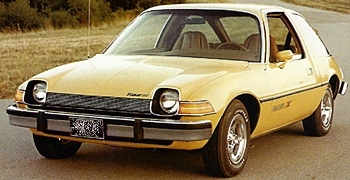 Pacer options included a number of sporty or luxurious interiors. With only cosmetic changes the Matador again lacks in sales appeal. Although roomy the aging and stoic design drew older buyers. The Gremlin remained the economical choice for buyers, now with a 4 cyl Audi engine. This was a limited addition made to capture the youth market. This would be Gremlin’s last production year, a GT was added to the lineup. New this year was the Barcelona trim package which included two-tone paint. The coupe also could be ordered with the Barcelona trim, adding the small rear opera window. Pacer got a new grill and an optional V8 engine. Based on their new model, the Spirit, this AMX had the same engine options. Little changed except interiors, the Concord tried to be the luxury choice. Another change, the Concord now had an available V4. As Pacer gained in popularity they added luxury options like reclining leather seats. 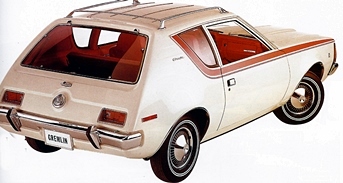 This Spirit Hatchback was basically a total redesign of the now retired Gremlin. 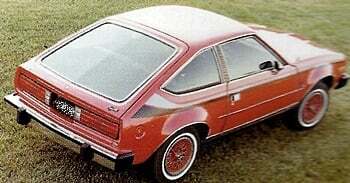 Adding the sloping roof gave this liftback the look of the very popular Ford Pinto. Check out these other makes and models! or click through the above to choose another make and model of car to reminisce about. Copyright 2014 – 2019. All Rights reserved. Michael Rich.